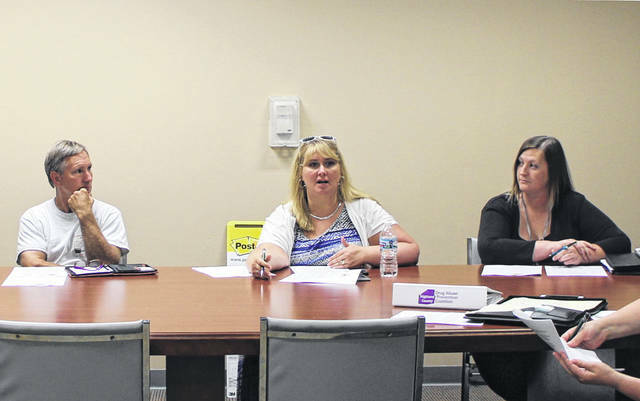 Highland County Drug Abuse Prevention Coalition President and REACH for Tomorrow CEO Heather Gibson, center, speaks to the coalition on Thursday. Also shown are Pastor Kim Zornes of Carpenter’s House of Prayer, left, and Danielle Poe of REACH for Tomorrow, right. Danielle Poe, an advocate with local nonprofit REACH for Tomorrow, told the Highland County Drug Abuse Prevention Coalition on Thursday that 79 percent of more than 200 Highland County residents who took an online survey said it’s alright to share prescription medication with family, illuminating what she sees as a gap in drug abuse prevention education for parents here. As previously reported, Poe and members of the coalition’s Prevention Committee have been compiling data for the last several months to create an informed strategic community plan focusing the coalition’s efforts on curbing drug abuse here. The plan, funded by a grant from the Ohio Mental Health and Addiction Services Board, will provide the coalition with specific action steps in coming months, and is expected to be approved by the coalition at its next meeting in July. Poe said based on the committee’s data, developing education for parents on the dangers of sharing medication should be made a priority in the plan. Poe said other initiatives should include organizing outreach events for parents and youth, assembling resources for school district personnel with an interest in drug abuse prevention, developing drug abuse prevention curriculum, forming youth coalitions, using social media and other media campaigns to change societal norms, and developing “drop-in centers” where students can spend time participating in constructive activities after school. In other updates, Creed Culbreath, also of REACH, said one person recently committed to pursuing addiction treatment after a visit from the Quick Response Team, a multi-disciplined group of first responders and treatment providers who offer treatment resources to overdose survivors. Culbreath said another person the QRT visited was “ambivalent” about treatment at first, but later took steps toward recovery. Coalition President and REACH CEO Heather Gibson said the Highland County Health Department has distributed 236 free naloxone kits to the public and 67 to local law enforcement. Naloxone, known by the brand name Narcan, is a drug that reverses the effects of opioid overdose. Gibson said REACH for Tomorrow recently donated 636 Narcan kits to local fire and EMS departments. Gibson said the Narcan was purchased using grant funding, not tax dollars. Culbreath, who sits on the coalition’s Treatment Committee, updated coalition members on local treatment initiatives, including raising awareness of local medically assisted treatment offerings and alternative treatment options. The coalition also discussed medication disposal bags that may be made more available to the public in coming months. Poe said the bags contain a solution that renders prescription medication ineffective and creates a non-toxic, biodegradable byproduct. REACH Advocacy Director and coalition member Beth Bullock updated coalition members on various advocacy projects, including efforts to develop a local chapter of Drug Free Clubs of America here. Prevention Committee chair: Jeff Myers. Supply Reduction Committee chair: Tim Bell. Harm Reduction Committee chair: Jared Warner. Advocacy Committee chair: Beth Bullock. Treatment Committee chair: Creed Culbreath. A vote will be called for electing officers next month, Gibson said.